Millions of Americans try their luck in the lottery often. Big chance their participants of the USA Power Ball Lotto. This is one of the most famous lotteries in the world. The fact that the rules are quite simple is one of the reasons for it’s popularity. As a player you just need to choose the right number from a series of numbers. If you succeed, you’ll win a big USA lottery Jackpot. Sounds promising! People from all over the world love to play USA Power Ball Lotto. It’s avaiable worldwide. From Africa to Australia to The Netherlands: everyone is welcome to play. So even if you’re living at the other side of the world, it’s still possible to win the Jackpot in this American lottery. The lottery sends you an automatic message when you’ve won a prize. The money will be even transferred automatically to your bank account. The first Power Ball draw was held in 1988. Since then the lottery has become incredibly popular. Back in the day it was known as ‘Lotto America’, until a name change took place in 1992. It’s organized by a non-profit organization called the ‘Multi-State Lottery’ (MUSL). In the early days people played with 59 numbers in total. Nowadays you can choose your lucky number from a series of 69. Nowadays it’s possible to participate in the Power Ball Lottery in several ways. Thanks to the internet gambling is easier than ever before. For example, you can buy lotto tickets online in just one click. How many lottery tickets and prize draws you want is totally up to you. You also shouldn’t forget to download the app of USA Power Ball Lotto on your mobile phone. This app makes it really easy to check the results, for instance. It’s very easy to buy the tickets for the Power Ball online. Just visit the website or a local store that sells lottery tickets. Although a ticket costs about € 4,75, you need to buy at least three lots. Otherwise you can’t participate in this lottery. Three tickets cost € 14,25. Not that much if you want to become a millionaire! You could also choose to buy a bundle of tickets. Most of the time this will get you a nice discount of 20 %. There are many lotteries in which you have to predict certain numbers to win. However, almost no organization is as big as Power Ball. In this very popular lottery you need to predict five numbers out of a range between 1 and 69. Besides that, there’s a so-called ‘Power Ball’ number. This number ranges from 1 to 26. Perhaps you could pick your favorite number or day of birth. It might bring you all the luck you need! It’s also possible to play with a combination of numbers and a Power Ball number. The amount of money you win depends on the numbers you’ve predict correctly, combined with the Power Ball number. Every Wednesday and Saturday there’s a lot of excitement in the air. On these days the Power Ball Lotto draws takes place. You do have to stay up late actually, because the draw takes place at 23.00 local time. In the Netherlands this is around 05.00 in the morning. Good luck with that! Unlike other lotteries this one uses two tombolas. The balls have two colors, namely red and white. Five numbers are drawn from the white balls and the red one is the Power Ball. In the United States you can watch the results live. In other parts of the world it might be easier to use the internet. With an online subscription you receive an automatic email if you’ve won a nice prize. Perhaps you find it hard to choose a certain number. In that case the computer will do this automatically for you. However, a certain strategy might also help. Some lottery players look to the so-called ‘hot’ and ‘cold’ number. This means that some numbers are drawn a lot in the Power Ball lottery, and others don’t. For example, a ‘hot number’ could be 12, 30 or 50. On the other hand, it could also be that the same numbers haven’t been drawn for a while. In that case they’re known as ‘cold numbers’. 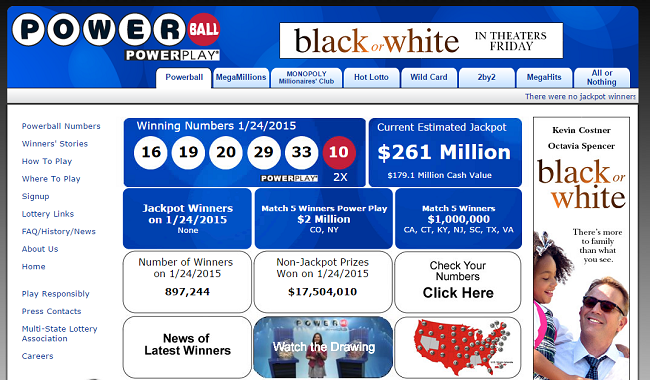 Always check the website of Power Ball Lottery to find out which numbers are hot and cold. The USA Power Ball Lotto is incredibly popular because of the high cash prizes. For example, the Jackpot starts with a minimum amount of $ 40 million. This will rise to an even larger amount if there’s no hit. In the past some Some Power Ball records have been broken. Once, four very lucky people shared a prize of € 1.56 billion dollars! It fell on January 13, 2016 and was the highest prize ever in the history of the Power Ball Lottery. It’s even the current world record for prize money. So it’s definitely a day to remember. The other prizes of Power Ball are high as well. Most of the time players have the chance to win millions of dollars/euros. However, these prizes are not tax-free. It means that you still have to pay an amount of money to the Tax Authorities. You could definitely win some amazing prizes in the Power Ball Lotto. However, your chance of winning the Jackpot isn’t very high. On average it’s about 1:292.201.338. Perhaps it’s better to set your hopes on the lowest prizes, because then your winning chance is about 1:38.32. In that case you need to have the correct Power Ball. On average the chance of winning a prize in the Power Ball Lottery is 1:24.87. Interesting numbers, but in the end it’s just about luck. The exact odds of winning are variable. However, you can increase your chance of winning by playing with several number combinations and multiple Power Ball numbers. Good luck! Prize money of Powerball can be paid out in two ways. The first option is called ‘annuity’, which means that a certain amount of money is paid for the next 29 years. Most winners prefer the cash option though, in which case they receive the prize money all at once. For both annuity and cash taxes still have to be paid. With a cash prize 38 million dollars has to be paid to the state as a tax revenue. According to calculations from the Wisconsin Department of Revenue taxes for the annuity payment will be 11.6 million dollars in 2019 and 47 million dollars in 2048.